Boulevard Supply carries 18 inch orange PVC traffic cones with reflective tape. 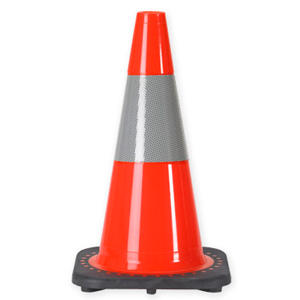 These 18″ traffic cones feature the 6″ reflective collar that meet both MUTCD standard and NCHRP-350. Reflective traffic cones are ideal for night use as they reflect the car headlights making them more visible to drivers. The 18″ height is more visible than the 12″ cones and allows for easier storage. Weighing in at only 3 pounds each makes them a breeze to handle for parking lot attendants and road crews.